You can improve your local music scene by taking the time to write about a show in your area. Write a live review of a New England act or acts of your choice at any venue you prefer. Email it to tmax@thenoise-boston.com with LIVE REVIEW in the subject. It will be posted on our website so all our readers can learn more about what you have experienced. Write to T Max at the same address for the live review guidelines. Speedy Ortiz cranked out a short winter tour with its Middle East date benefiting Girls Rock Campaign Boston. The GRCB is a program, which, though music education and performance, provides a supportive community to girls in order to foster self-expression, confidence, and collaboration. Sadly I had to miss the early performances by graduates of the program in favor of my son’s high school holiday chorus production. I arrived just in time to catch the last few songs of Ursula’s set. The duo – guitarist and drummer –were a dark, gothic pair of ladies. There was much noisy grinding of guitar and banging of drums, accompanied by copious screaming and moaning. If you have ever seen any movie from the’80s depicting a goth or punk band, then you’ve seen something akin to Ursula. If you have ever heard the sound of cats mating while Black Sabbath plays in the background, then you’ve heard something akin to Ursula. Next up, Providence, Rhode Island’s, Downtown Boys rip out an energetic set of political punk. Their sound combines the X-Ray Specs with the Plasmatics, and some Voodoo Glowskulls (sans the ska). It’s a killer combination that suits their far-left political passions. Speaking frankly, I could do without the nonsensical political ranks that blossom between each song. Most sound like random non-sequiturs – combining fascism, abortion rights, religious tolerance, and revolution – than any cohesive statement of position. Nonetheless, the music is stirring. Played hard and fast, bouncing from English to Spanish, they barrel through their half hour set like a multi-ethnic tornado. The most impressive aspect of Downtown Boys is their sax player. She looks and dresses like Cindy Williams – Shirley from the classis sit-com, Laverne & Shirley – and plays her sax like a lead guitar. She pulls out solos for every song and bounds around the stage unleashing Pete Townsend-esque leg kicks and mighty squawk from her instrument. 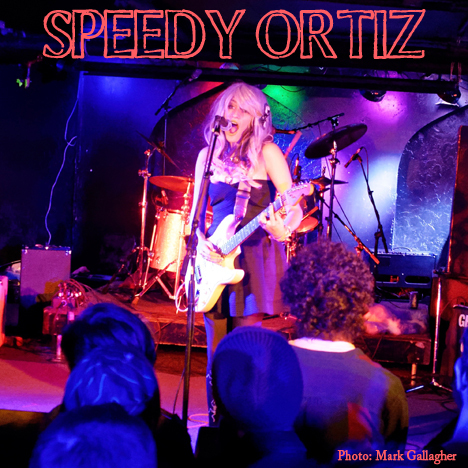 There is so much to say about Speedy Ortiz. It’s hard to know where to start. They came out of nowhere (well, out of North Hampton, Mass.) in 2012 and have taken Boston and the national indie underground by storm with their noisy ’90s alternative rock style. Speedy Ortiz sound a little like every one of your favorite bands from that era without ever sounding like a knock-off. You’ll find some Breeders, some Belly, some Letters to Cleo. There’s some Liz Phair, some Throwing Muses, and some Juliana Hatfield. How can you possibly go wrong? As amazing as the players are, this is clearly Sadie Dupuis’ show. As she takes center stage in her baby blue and silver party dress, under blue and white lights, the band fades to the background. Her silver and blue hair, pale makeup and blue lipstick make her look like a like a cross between iZombie’s Liv Moore (Rose McIver) and Else from Disney’s Frozen. The effect is pale and icy while, at the same time, she pops like a sparkling, animated Cinderella. She is stunning and commands the audience’s attention without ever really having to try at it. The music is pure ’90s alternative guitar noise buoyed by Sadie’s effervescent vocals. When I say noisy, think Pavement or the Pixies at their most abrasive; but mixed with a little Sonic Youth at their most tuneful – now you have the picture. The masterful mix of melody and noise is something that I have missed immensely over the past 15 years. Speedy Ortiz performs a master-class on this technique. I’m instantly transformed into my 25-year old self, circa 1995. I pine for they heyday of WFNX and the alternative rock boom of that decade. Don’t get me wrong though. Speedy Ortiz is not a throwback act. This group resonates with both aging hipsters and the up and coming generation of indie rock fans. It is a pleasure to have been around long enough to experience up and coming bands take inspiration from the underground of my youth. And to be able to see someone do it as well as Speedy Ortiz is a true treat. I’ve been following The Mighty Mighty Bosstones and going to their shows for over 20 years now, but I was especially excited for this Hometown Throwdown when I found out that The Neighborhoods were one of the openers. They are one of the many great Boston bands whose shows I missed in the early days, but have always wanted to see! First, the noblemen from The Upper Crust stride snobbishly onto the stage, adorned in their gilded 18th-century attire. These guys may not reveal their souls onstage but Lord Bendover, Count Bassie, The Duc D’istortion, and Jackie Kickassis, sure do bring on a kickass performance. They play a timeless hard rock enjoyed by all! The Neighborhoods, definitely a part of Boston’s rock royalty, come on next. They exert incredible energy, covering the stage from end to end, running and jumping while playing nonstop. Their excitement is contagious and I feel the music running through me – the whole reason I love to see bands play live! They play so many great songs, fantastic covers, a bunch of hits and all my favorites… save for one. I get it, I get it, perhaps I would feel like taking a bunch of kindergarteners hostage too if everyone demanded that I play “Prettiest Girl” at every show for over 30 years. They make up for it though playing a great cover of The Clash’s “Safe European Home.” Before the song lead singer/guitarist Dave Minehan reminisces about seeing this great band perform in Harvard Square and how that day changed his life. “I started a band because of them, just like everyone else.” As the song winds down, he sings loudly “And I’ve got so much gratitude.” Make sure you check out the Big Shot in this issue to see the man filled with gratitude. The evening continues now with a different vibe, a few songs from Lenny Lashley’s Gang of One. Just one guy off to the side of a dark and empty stage. Alone with his guitar, he stands resolutely with a spotlight shining down on him. His acoustic tunes don’t call out angrily, but tell stories with words that everyone can feel. Now, as the curtains are ripped down, The Bosstones pour out and we see a stage set to honor the old Rathskellar, “the granddaddy of Boston rock venues.” The back of the stage is decked-out to look just like the brick front of the club, including the signs “Food – Drinks – Music” and above that “Rathskellar” in the old-style German font. My introduction to the Boston music scene began in the seventh grade. I wasn’t as immersed in this scene growing up as I would have liked, but I went to a few memorable all-ages shows at some of the Boston clubs. For some reason though, I never made it down to that club, also affectionately known as The Rat. It’s great to see this historical part of the Boston music scene, just as I imagine it once looked, and to see the bands that played it then playing it now! The Bosstones get the crowd excited just as soon as they enter and they keep the energy going. This is nothing new: every Bosstones show I have been to is like this. The crowd is filled with hundreds of the faithful who plan for this show all year and book their flights well in advance. They come in all ages, know all the songs, and sing along to every one. There are also plenty of new fans: for some this is their first concert, for others it is just their first time seeing The Bosstones. You can usually tell the groups of people apart by their expressions: the virgins are just as excited, but also pretty wide-eyed. The reminiscing continues as we are introduced to surprise guest, Jimmy Harold, former owner of The Rat. Dicky exclaims sardonically “He hasn’t aged a day, but then again he looked old back then.” The laughter continues through the night, as do the songs. Many hits are played as well as cover songs, including the appropriate one titled, “At the Rat” (by Willie “Loco” Alexander & the Boom Boom Band). I must begin this review by applauding the bizarre and cozy “gallery” this show was held in. More accurately, it’s one of the best venues I’ve ever been in, because it’s so unique and so comfortable and casual. Part odd-gift-shop, part indie-rock art-studio cubicles, and a sprawling schizophrenic “gallery”. You can even see that some cheesy clothing store used to occupy this space, by the mirrors on the ceiling! Across the street from the Middle East Cafe, this space should hold concerts every night! This show was put together by the lovely folks at the Boston Hassle, so I went blind, having heard none of the bands. And it couldn’t have been more perfect. Dyr Faser are a duo (possibly containing indie rock legend Thalia Zadek) doing lush, simple, vulnerable music, with twin reverb guitars over casio drum machine beats and a bit of cheap organ, while the video projections on the musicians made it look and feel like we’re seeing early Pink Floyd / Velvet Underground… except those bands didn’t play in a weird gift shop! I’d call it paradise– but then you’d think of a more-normal rock club! The audience even has a choice between love seats and recliners, or sitting on the carpeted floor, befitting the post-psychedelia of this first act. Back at the entertainment hub of Byfield, Massachusettes we’ve got Marina Evans opening for Lenny Solomon and his band. Every table is full in this big, square, high-ceiling room with the four-foot high stage. Host and booker Heidi Fram greets the audience and warmly introduces dues Marina who’s currently living between Rockport, MA, and Italy. Marina presents herself well – with God-given pretty features and a well trained voice she’s got a lot going for her. She starts with “Blue Yonder” and from from her banter you get the feeling that having a husband living in Italy and family and friends in Rockport is pulling on those heart strings. “Middle of the Ocean” also reflects on her current situation. Her sets peaks with a lovely song that she sets up perfectly. During last year’s brutal winter she spotted a solo mitten in a large melting pile of snow. “One of Two” takes the lone mitten and turns it into a wonderful metaphor of one hoping to be reunited with another. I guess this song also falls nicely into place with her pair of homes. Sometimes there’s a great notion to create a multi-purpose band that features sympathetic talents. As long as there are people that like to sing and send words into other ears, there will be a band that is required to have lived with the past to reaffirm their influences and still stay focused on creating modern music. Let’s say hello to Hummingbird Syndicate, featuring local luminaries Jon Macey (Fox Pass), Lynn Shipley (Adam & Eve), Chris Maclachlan (Human Sexual Response), Lenny Shea (The Stompers), and two Californian folks I don’t know, Mary Jaye Simms and Dan Coughlin (Children of Paradise) who are not here tonight, being replaced by Tom Hostage (Macey’s Parade) and Rich Lamphear and Linda Viens (Kingdom of Love) and additional singer Jennifer Lewis Bennett. Originally from Connecticut, Matt Bednarsky has called Nashville home for some time. Tonight, he makes his return to the East Coast at one of my favorite little venues. His solo performance is a range of original tunes and covers, and even includes a mashup of well-known songs that delights the crowd. There’s little conversation among the two dozen people in attendance, some clearly there to enjoy the music, others walk-ins to get dinner or a beer. Matt tells all kinds of tales that night, including one of the time his guitar was damaged in a wind storm in a small town. The local repairman said it couldn’t be fixed, so he went to another to get a second opinion – this person happened to be that town’s mayor.